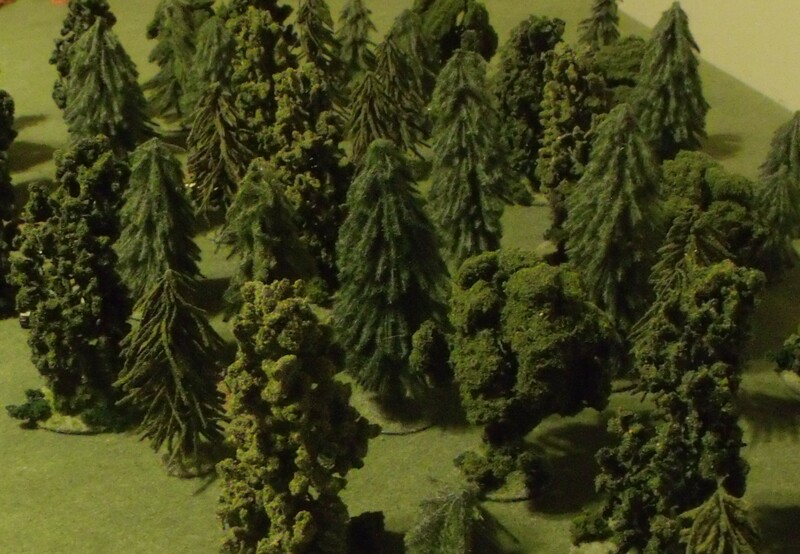 Having a nice variety of trees can add a lot to your gaming terrain! For this reason we are continuing to expand our tutorials on gaming trees. These latest additions were made from readily available materials and cost considerably less to make than comparably sized ready-made ones. Previously we have used some flowers as armatures to make small to medium sized trees. This time we wanted to make some larger ones. So we selected some very large flowers that looked a little like trees. The first step was to remove the flower groupings from the rest of the plant. Each flower was then hot glued down to a large washer, painted, flocked, and some extra details were added to the base. This next flower was a somewhat unlikely looking plant, however it does make a reasonable looking tree when mixed in with other trees. It’s a very good inexpensive filler tree for when you need lots of them on a budget! They are an inexpensive plant with lots of flower stocks on each one. We used the same process of flocking and basing to transform the flowers into good miniature trees. Previous post: Two new models have been added to the store. Next post: Concept sketches of a 15mm Trench System.